Home » Actualities » News » JSC „SPODRĪBA” with ecological product line ECO SEAL FOR NATURE receives “EU Ecolabel” certificate. JSC „SPODRĪBA” with ecological product line ECO SEAL FOR NATURE receives “EU Ecolabel” certificate. 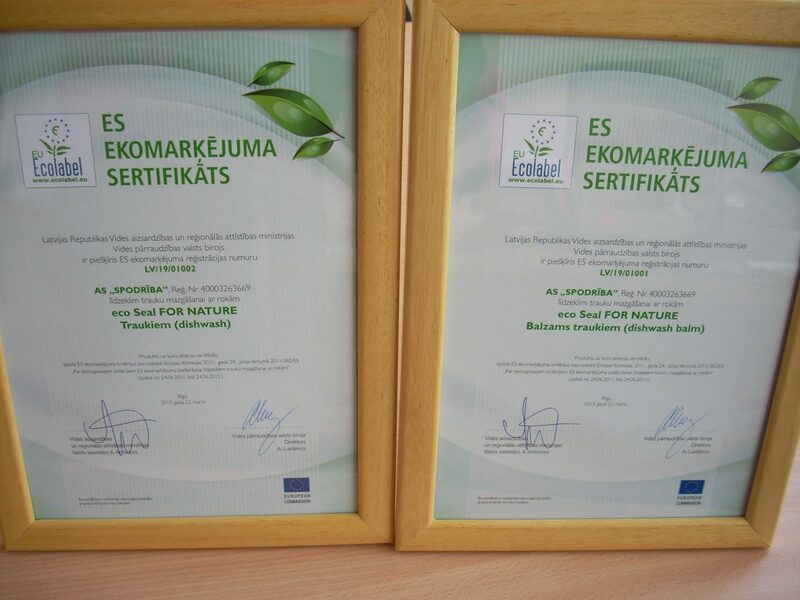 JSC „SPODRĪBA” is the first manufacturer in Baltic states who has applied in Environmental supervisory authority for European Union official Ecolabel mark for new product line ECO SEAL FOR NATURE, which came out on September of 2012. To recognize the products in all European Union (EU), it was decided to follow the official EU Eco label “Ecoflower” ecological criteria in their development. They certify the product compliance to the highest environmental standards. The products are environmentally friendly throughout their life cycle – from production to disposal. „EU Ecolabel” certificate to JSC„SPODRĪBA” was handed in solemn ceremony involving representatives from Environmental supervisory authority and Ministry of Environmental Protection and regional Development representatives, as well as Secretary of the State Aleksandrs Antononovs. Event took place on 22nd of March. By handing the certificate, Secretary of the State Aleksandrs Antonovs expressed satisfaction that businessmen in Latvia think more and more about long lasting actions. And about nature protection thinks, not only because of the love for the nature, but sees it in economic terms, stressing out that „green” manufacturing can be effective. “Ecolabel” is received by those products that are carefully evaluated by nine criteria, said Enviornmental supervisory authority director Arnolds Lukševics. These products prove that it is not necessary to be colourful with big packaging. He thinks that by being the first ones in eco production manufacturing in Latvia for company will give large experience and at the same time will educate consumers in environmentally product usage. First from ECO SEAL FOR NATURE product line „EU Ecolabel” receives dishwashing liquid – „ECO dishwash balm” and „ECO dishwash”. Step by step all other 9 products (ECO universal, ECO bathroom, ECO floor, ECO WC, ECO laundry universal, ECO laundry colour, ECO laundry black, ECO cream soap un ECO soap) will be applied “EU Ecolabel” certificate. Director of JSC “SPODRĪBA” Baiba Megre-Ansviesule informed, that idea about eco line production arise 3 years ago, in Scandinavian where she exploring market. Then company realized that if they want to expand export to these countries, they must follow world tendencies and create new, high quality product line that is developed by “EU Ecolabel” criteria. “For us it was encouragement to be pioneers in Baltic States. By that we wanted to create example that also in Latvia we care about our health and environment.” said director of the company. She reviled that during this year for all ECO SEAL FOR NATURE product line is planned to receive „Eu Ecolabel” certificates. JSC “SPODRIBA” is the first manufacturer in the Baltic States, who have initiated production of ecological cleaning and cosmetic products. We have managed to combine eco-friendly composition with the properties, which make ECO SEAL FOR NATURE line products to be a reliable and effective assistant in your home. These new products are a step towards a way of modern and green thinking – they do not contain colorants, phosphates, allergens and unnecessary preservatives..
JSC „SPODRĪBA” says many thanks to all partners – Asthma and Allergy association, World Wildlife foundation,state institutions and associations, media as well as clients and consumers for choosing nature and humen friendly products, supportiong ECO SEAL FOR NATURE project.